Kye Khan was born August 2007. His mom is our girl Tasleem Khan and his dad is our boy Razam Khan. 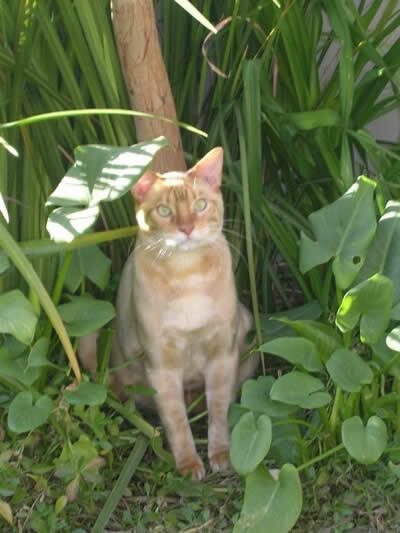 Kye is a new Bengal colour in South Africa and is not an accepted colour for showing in South Africa. 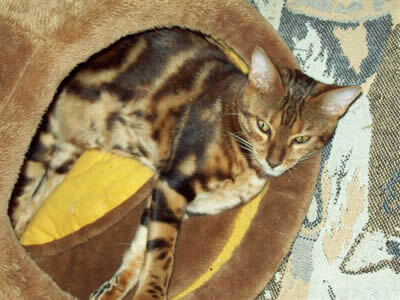 His colour has been classified as a Cinnamon mink Bengal. This is a picture of Kye at 3 months old. He is still very light in colour here and is still busy changing colour now. Many thanks to his new mom Azure and her mom Stephanie for exhibiting Kye at various shows for us to get his colour shown and recognised. Kye like his mom Tasleem is extremely naughty and outgoing. He continues to keep Azure and Stephanie on their toes with his antics. He has recently got a new friend a Shepei and I believe he loves to wrestle with his new dog companion. Tigger Khan was born August 2007. Like his brother Kye he is also a new Bengal colour in South Africa. 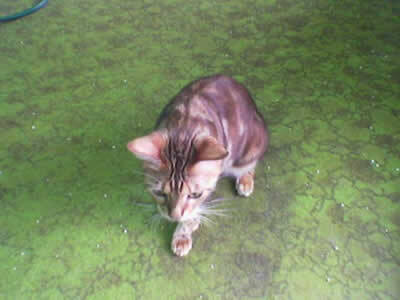 Tigger is a cinnamon marble bengal but he is not a acceptable colour for showing in South Africa. Tigger lives with his new family in Cape Town. He has turned out to be an amazing character. He loves Joy's two daughters and goes everywhere with them. Tigger apparently thinks nothing of jumping in the car with Joy and her family for an outing. He goes on holiday with the family and will even walk with the family when the dogs get taken for a walk. We always love getting updates on this little boy such a character!!! Balieu Khan was born August 2007. His mom is our girl Tasleem Khan and his dad is our boy Razam Khan. This was one of our most unusual litters for 2007 and such characters!!! Balieu was the most lovable kitten in the litter and I believe still is. Balieu lives with his cousin Shinga and his new mom Jackie and dad Craig. Mewsli is from our 2006 litter from our girl Tasleem and boy Razam. Mewsli now lives with her new mom Lynette and cousins Caramel and Thumpurr. Mewsli is the naughtiest kitten we have yet produced but such a character. Her mom Lynette tells us that she is just as naughty and mischevious as her mom Tasleem. She is also apparently too clever opening doors is no problem to her enquiring mind!! 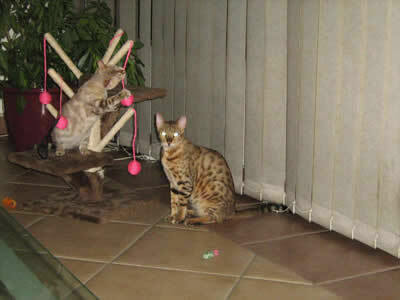 Rania is a brown marble Bengal from our girl Tasleem and boy Razam. She was born 1 September 2008. From being the tiniest kitten in the litter she has amazed us how she has turned out. She now lives on a plot with her new mom Hayley and her cousin Maysa. Rania has gorgeous three tone markings and tons of glitter. Congradulations to Hayley for turning our tiny little princess into this beauty queen. 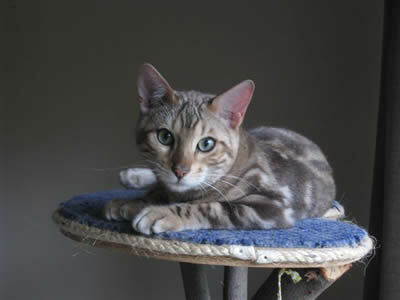 Selene is a mink marble Bengal from our girl Tasleem and boy Razam. She was born 1 September 2008. She now lives with her new dad Nigel.